Having trouble with your toilet? You might be in the market for a new one! Most people don’t think too much about the toilets in their home unless there’s a problem with them. They end up using the same toilet for many years. While commodes are designed to last a while, invariably problems will surface that will make you consider replacing them. If you’re experiencing any of these four signs, you should give some serious thought to getting a new toilet! The most common reason that leads homeowners to replacing their toilet is that it simply won’t do its job anymore. Clogs are a fact of life with toilets every now and then, and there’s no such thing as a clog-free model. However, if it seems like you’re reaching for the plunger every time you use the commode, it is a strong sign that you should consider upgrading to a new toilet. Most toilet bowls are made of porcelain, so cracking of the bowl is another major problem that may lead you towards the replacement route. Fractures on the lid are common as well, but lids can take damage more easily than bowls. If you notice a crack on the bowl, feel the floor underneath the toilet for dampness or simple water damage. 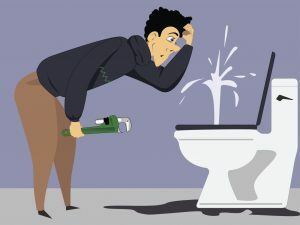 If you feel it, it’s a strong indication that you have a leaky toilet and you need to have professionals come to replace it as soon as possible for health reasons. Internal leaking is another big problem, but not quite as noticeable as leaking from a cracked bowl. Your toilet could be letting water drip from the tank to the bowl. The best way to notice this happening is to listen for water hissing back at you when the toilet is not in use. You can also use food coloring as a test. Drop 10 drops of coloring into the tank, wait 10 minutes, then return to the bowl and open the lid. If the water in the bowl is colored, you have a leak. Of course, you might want to replace that old toilet simply because it is old! New toilets are available which use less water than older models and can save you some money on your water bill. The initial outlay might hurt, but the investment will pay for itself over the long term! This entry was posted on Thursday, February 2nd, 2017 at 9:04 pm. Both comments and pings are currently closed.